One of our favorite things about this time of year is the fun and creepy (but still delicious) Halloween gummy candy! This year, we have a wide selection of creepy gummy candy to include in treat bags or add to your spooky desserts. Gummy Eyeballs: Always a fun, creepy trick for your Halloween guests! Gummy Witch Stockings: Witches normally occupy abandoned houses or forests, but they’ll arrive for the party for these yummy stockings! 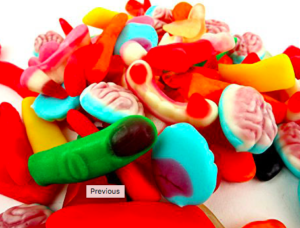 Gummy Body Parts: Bag them up to creep out the trick-or-treaters! Gummy Brains: Hand them out on Halloween or fill your candy dish with them – just be prepared to fend yourself from hoards of hungry zombies! Gummy Hairy Spiders: Sweet, fruity, and coated in sugar, these chewy little monsters will win over even the most squeamish! Here at Blair Candy, new Halloween candy treats and supplies are arriving every day! The orders are already coming in from Halloween fans across the country (folks who know how quickly the best and newest candies can sell out!). We do our best every year to ensure we have enough Halloween candy to carry us through October 31st, but sometimes we can’t predict which will have the most popularity. 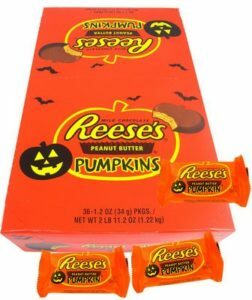 Reese’s Peanut Butter Pumpkins are a top pick year after year, and we’re certainly never surprised by how many orders for our various creepy Halloween gummies come through. But we do add new treats every season that you’ll want to scoop up fast to ensure your sweet tooth gets satisfied. And with Halloween itself growing in popularity every year, shopping early for all your Halloween candy and supplies might be best! Candy Apples and Corduroys: Fall is Here! At the end of every summer, we all seem to come down with a case of Fall Fever. With the changing of leaves and the re-introduction of pumpkin flavor-inflused treated, we all get excited to swap our tank tops for hoodies – and of course, indulge in all our favorite fall treats. As the temperatures cool and we start to enjoy the autumn ambiance, we also see a difference in whats in our candy jars. 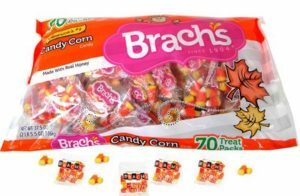 From Brach’s candy corn to caramel apple lollipops, fall-friendly treats go magnificently with a pumpkin spiced latte! Rather than visiting the candy aisle at your local retailer, shop our bulk Halloween candy for the best savings. Our selection is sure to inspire you to get in the holiday spirit!